While we encourage all donations to be made online, we realise this isn't always possible. Please download and fill in the sponsorship form below if you are collecting any offline donations. Use the payment method listed below to pay in your offline donations. 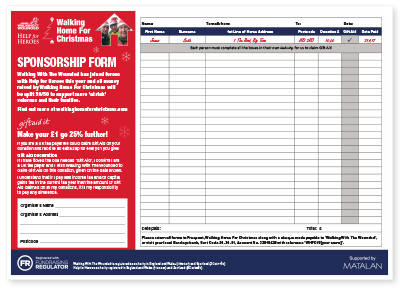 Please make payable to: Walking With The Wounded (Please note – all funds donated for this campaign will be split 50/50 with Help for Heroes in January. Should you wish to make an electronic bank transfer, please email us at [email protected] with your participant details (name, email, profile page link) and the amount you are transferring so we can match this up and allocate it to your page. To pay your donations in at any Clydesdale Bank, please email us at [email protected] with your participant details so we can match this up and allocate it to your page.